Meet your new favorite, go-to soup! 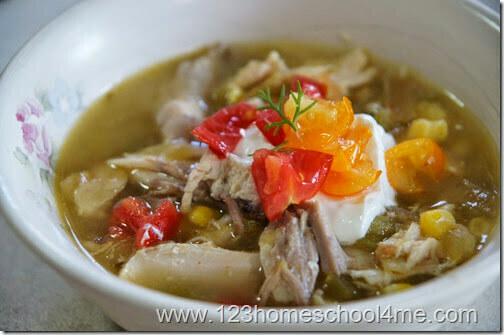 This easy to throw together Green Chicken Taco Soup Recipe tastes amazing! Your whole family is going to love this! 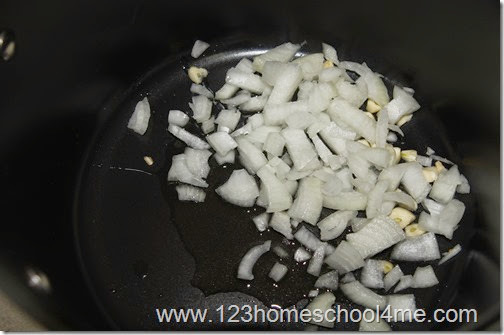 In stock put sauté 1 chopped onion and 3 cloves of garlic in 2 TAB olive oil over medium heat for 3-4 minutes. Meanwhile, cut up 1 lb of chicken meat. You can use any cooked chicken you like, but we like to purchase a day old rotisserie chicken (which makes them cheaper) and just cut it up. 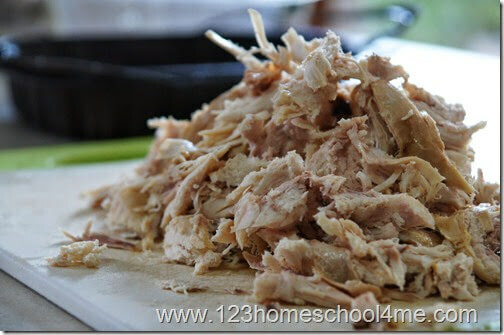 As you can see 1 rotisserie chicken pulls apart very nicely for soup or sandwiches! HINT: Costco sells meet from a rotisserie chicken already pulled off for you! 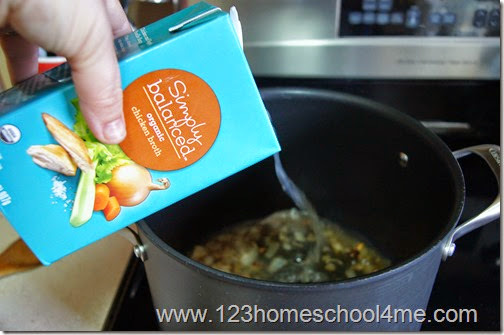 Add 1 quart (a box) of chicken broth. Increase heat to medium-high. Add 1 large jar of Salsa Verde, cut up chicken, 1/2 cup cheddar cheese, salt & pepper, and 1 cup of frozen corn. Cook until heated thoroughly, about 6-8 minutes. Serve your flavorful soup with sour cream and additional tomatoes if you like. 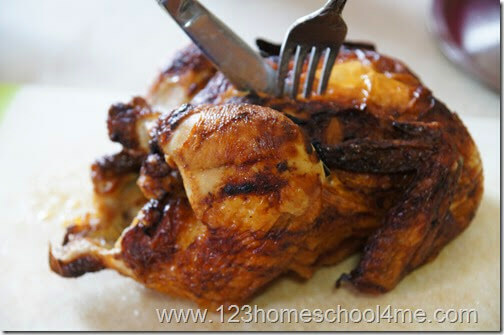 Meanwhile, pull off chicken from Rotisserie chicken. HINT: You can buy meat already pulled off from rotisserie at Costco. 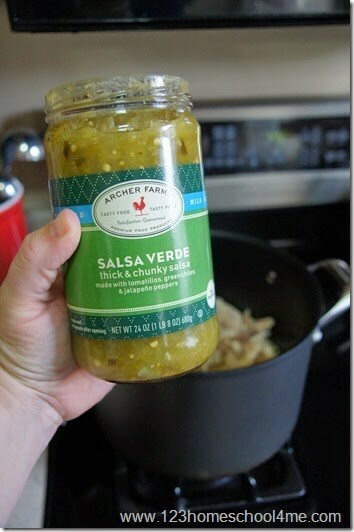 Add 1 large jar of Salsa Verde, cut up chicken, 1/2 cup cheddar cheese, salt & pepper, and 1 cup of frozen corn. Cook until heated thoroughly, about 5 minutes.